Having ants as regular visitors to your home is not something that anyone would wish for. Apart form their painful and irritating bites, they can also pose a danger to your health and to others living in your home. But, one may wonder, how to you get rid if these insects in your home. There are a lot of products that have been developed to help you in doing this. These products are made differently and not any one product will deal with your specific ant problem; their effectiveness will differ depending on the specific ant problem in your home. They also differ in terms of how long it takes for them to completely destroy and kill ants that have infested your home. This article is going to provide four popular ant products that will completely get rid of ants in your home. Continue reading to find out more. This insecticide is one of the best products to get rid of ants in and around your home. It is made up of powerful anti-ant ingredients including Borax and is quite easy to use. The use of this liquid ant bait involves cutting off the top of the bait and placing it on the areas that are mostly visited by ants. Please note that while this product is effective in terms of minimizing the number of ants in your home, their result is not instant as they need some time to enter and interfere with the digestive system of the targeted ants. As a matter of fact, the number of ants in your home might increase for a while after the ant bait is taken. This might take up to two weeks before the poisoned food ends up in their colony and kills the ants responsible for reproduction. Terror T300 Liquid Ant Bait may also cause serious health effects when consumed by humans or other animals. As such, they should be kept where small children and pets cannot reach. Also, to add to its effectiveness in killing ants, other potential food sources should be eliminated to ensure the ants only have the poisoned food to take back to the Queen ant in the colony. Combat Max is also a very effective ant control product in the market right now. This insecticide has no major differences to other popular ant killer products, but is very useful in dealing with the ant menace as well as other unwanted insects and their entire colonies. This insecticide has a higher content of water which is helpful in that it encourages ants to feed faster on the poisoned food. Due to this reason, it works faster and provides results within an hour of its application. The use of this product is quite easy and does not require the help of ant control professionals. This is because it comes in a syringe that allows the insecticide to be applied on areas that would otherwise be difficult to reach without the use of the syringe applicator. Even if ants travel through small cracks, the insecticide will still reach them without making any unnecessary damages on your wall or floor surfaces. However, the insecticide does not work well during rainfall as they are prone to being washed away. This will require you to re-apply the insecticide to the affected areas every time after a rainfall for it to provide results. Ortho Home Defense is yet another useful insecticide in the control of ants in and around your home. The insecticide is made up of very powerful ingredients that destroys and kills ants, among other unwanted insects in your home, with only one application. It is also cost effective. Only one application is required to take care of eliminating ants in your home for a much longer period, which may take up to three months. The insecticide will also deal with insects that are far from the specific area where the insecticide was applied. It is also simple to use. This involves the application of the powerful product on the foundation of your home compound. If ant infestation in your home is a serious problem, Advion ant gel would be the perfect solution for you. Although the insecticide is quite costly in terms of its price, it is professionally made to deal with the annoying insects with very effective results. It is easy to use and produces result within a short period of time. The ingredients that are used to make this product are strong. Its use involves poisoning food that the ants usually feed on and placing it on the specific area in your home that is greatly visited by ants. The worker ants will then come for the poisoned food and take it to the Queen ant back in the colony. When the Queen ant feeds on it, it will be dead in a few days. Killing the Queen ant will have solved the ant problem in your home as no more reproduction will take place after the Queen ant is killed. 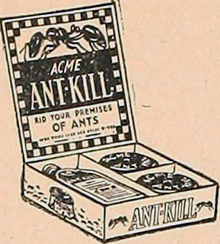 With the products mentioned in this article, getting rid of ants will no longer be a difficult task for you. Most of these insecticides are easy to use and also come with written instructions that will guide you on their application. This ensures the insecticide achieve the desired results in less time. Apart from the ones mentioned above, there are many other products in the market that will greatly help you in eliminating these unwanted visitors to your home. They are also readily available in the market and can easily be purchased through online stores such as Amazon. In case the ant infestation in your home is so serious that the above products cannot completely get rid of them, it would be best to seek the services of ant control experts to help you deal with them.